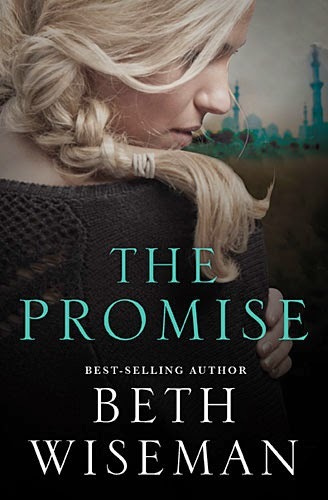 The Promise introduces readers to Mallory Hammond, a young woman who takes a dangerous journey to Pakistan, fueled by her adventurous spirit and her desire to save a life. Instead, promises are broken, her life is put at risk, and all she can do is pray she’ll make it out alive. Mallory’s character was closely modeled after someone close to the author, and Wiseman herself was actively involved with bringing her safely home. 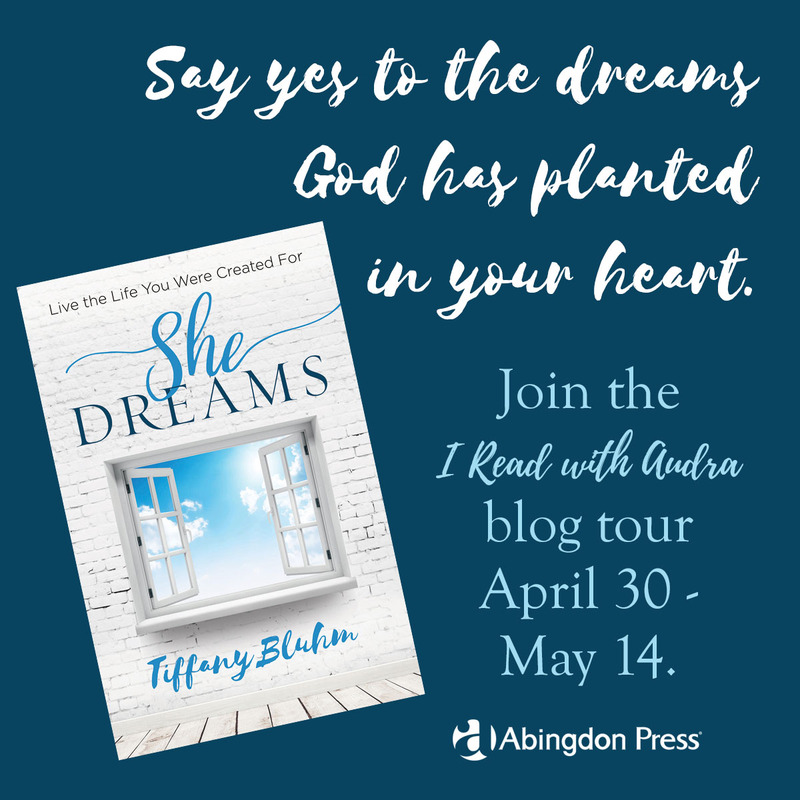 Struggling to find her own faith and at a crossroads in her current relationship, Mallory is searching for purpose in her life. She is determined not to let her boyfriend, parents or anyone else get in the way of her number-one goal: to save a life. Mallory had the chance to save her cousin’s life when she was a teenager, but the opportunity slipped away, leaving a void she's desperate to fill. She made herself a promise that someday she would reach her goal. Mallory’s boyfriend, Tate Webber, has loved her for years and understands Mallory's free spirit has to fly. When he has no choice except to give her the space she needs, he hopes when she lands, the two of them will be in the same place and can marry at last. However, when Mallory meets a new friend online, she is offered the chance to make good on the promise she made long ago. The opportunity means that she’ll have to leave behind everyone she loves to take it. In a bold move — and with lots of resistance from those closest to her who question her judgment — Mallory decides to travel across the world to fulfill her dream. Tate begs her not to go, but Mallory embarks on the dangerous journey to Pakistan anyway, not realizing the people she trusted have put her in harm’s way. She will soon discover how swiftly and easily promises can be broken. Mallory must rely on faith and prayer to make it home alive. 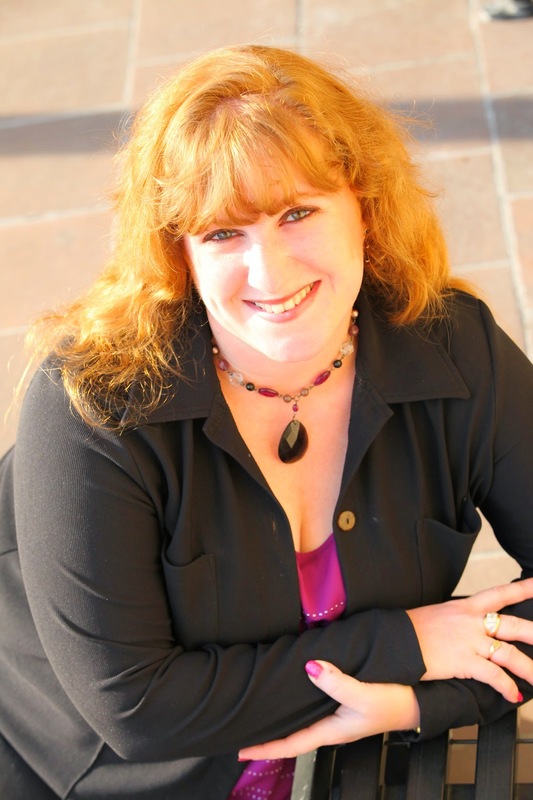 Wiseman can be found at Fans of Beth Wiseman on Facebook where she interacts with readers. Learn more about the author and her books at bethwiseman.com and on Twitter (@bethwiseman). 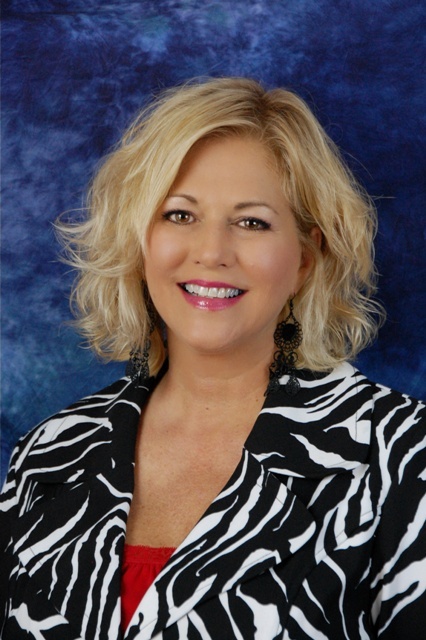 Beth Wiseman is the best-selling author of the Daughters of the Promise series and the Land of Canaan series. Having sold more than 1.3 million books, her novels have held spots on the ECPA and CBA bestseller lists. 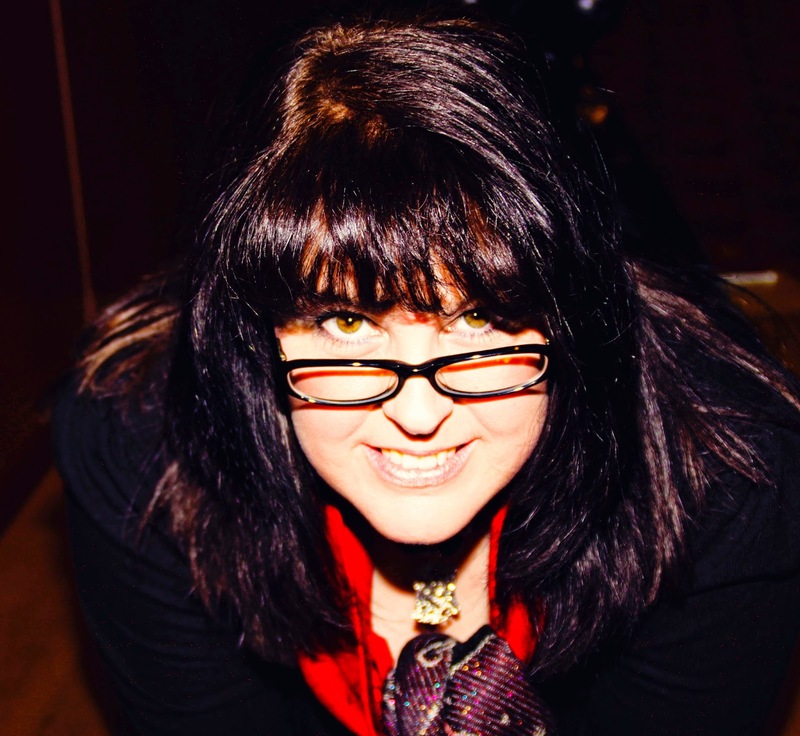 She has also been the recipient of the prestigious Carol Award (in 2011 and 2013), a three-time winner of the Inspirational Readers Choice Award, and an INSPY Award winner. In 2013, she took home the coveted Holt Medallion. As a former newspaper reporter, Wiseman was honored by her peers with eleven journalism awards, including first place news writing for The Texas Press Association. She has been a humor columnist for The 1960 Sun in Houston and published articles in various publications. However, writing novels is where her heart is. She left her job as a journalist in 2008 to write novels fulltime. Wiseman has a deep affection for the Amish and their simpler way of life, and while she plans to continue writing Amish love stories, she is also branching out into other areas. In her daring new novel, her third non-Amish, contemporary, Wiseman jumps way outside the box. The Promise will take readers far away from Amish country and the small Texas towns of her previous releases to a dangerous place on the other side of the world. Inspired by actual events, Wiseman believes this is the book she’s been working toward for a long time. Wiseman and her husband are empty nesters enjoying the country life in Texas with three dogs, two cats and two potbellied pigs. When she’s not writing, she loves to travel, paint and enjoy time with friends and family. With cooler weather coming just around the corner, it will soon be time for readers to pull out the quilts and settle in with a new book. 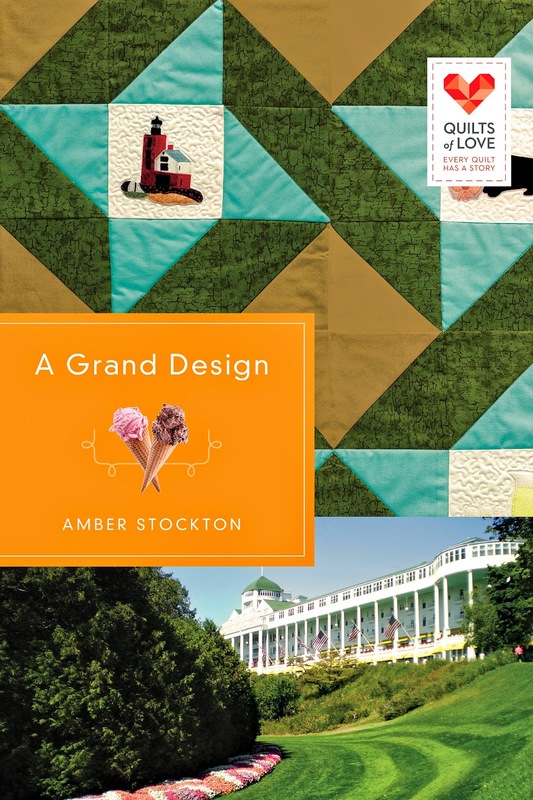 Abingdon Press authors Amber Stockton and Robin Caroll invite readers, with quilts in tow, to join them for the live Quilts of Love Fall into Fall Facebook chat on October 7 at 8:00 PM EDT to talk about their latest releases, A Grand Design (Stockton/August 19, 2014/ISBN 978-1426773471) and Hidden in the Stars (Caroll/September 16, 2014/ISBN 978-1426773600). The live Quilts of Love quarterly event will center on an interactive chat between the authors and readers, allowing participants from around the country (and the world) to participate in one large book club. The authors will share the inspiration behind their stories and ask discussion questions surrounding the themes of each book. Chat participants will be eligible for prizes, including copies of books from the series and gift cards, to be given away at the end of the hour. The winner of the $200 Visa Cash Card giveaway, held in conjunction with the latest Quilts of Love blog tour, will also be announced. 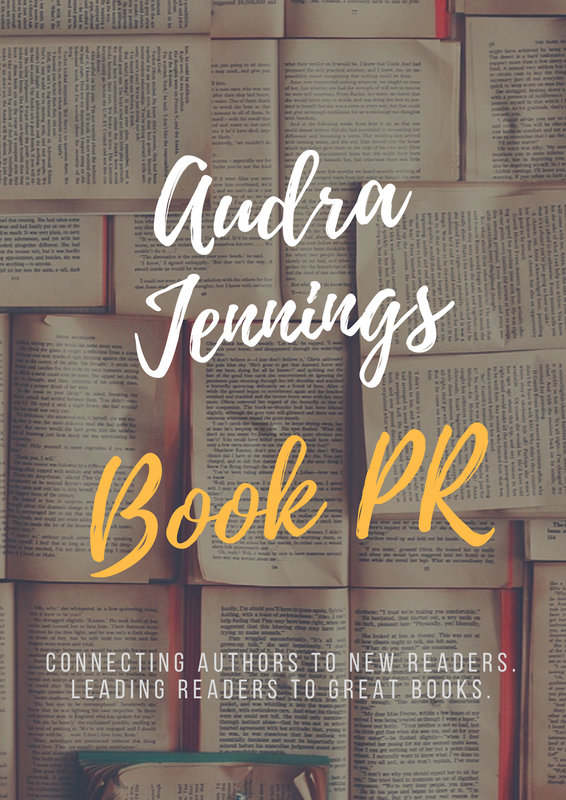 The chat has been promoted online with the help of bloggers participating in the blog tours for each book coordinated by Litfuse Publicity Group. The Quilts of Love series centers on the idea that quilts tell stories of love and loss, hope and faith, tradition and new beginnings. Each release focuses on the women who quilted all of these things into their family history. 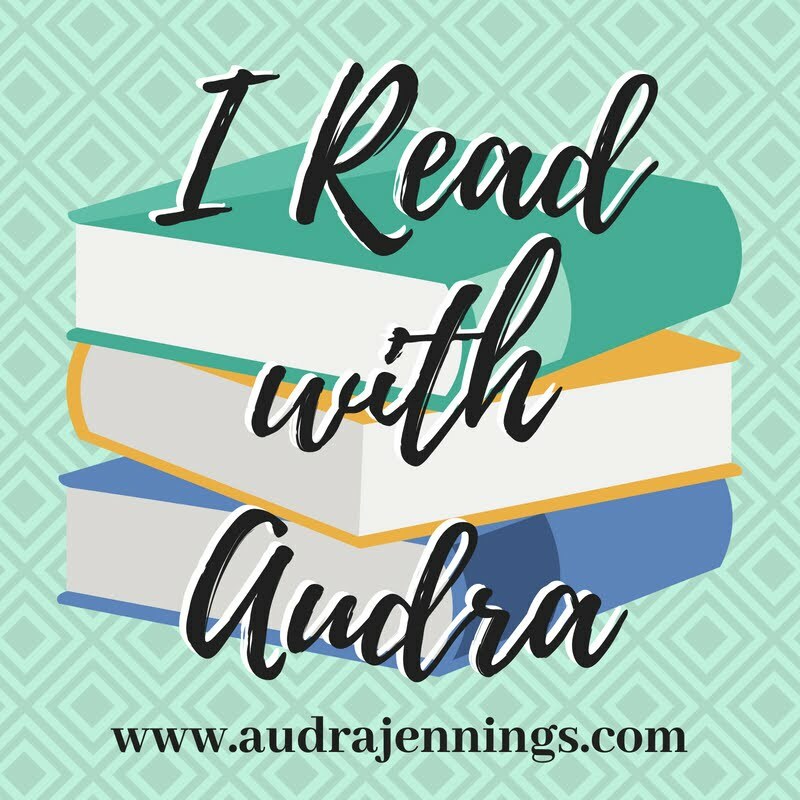 Featuring contemporary and historical romances, as well as Amish fiction, women’s fiction and the occasional light mystery, readers are drawn into the endearing characters and touched by their stories. A new book will be released each month through January 2015. A special tradition the authors have instituted with each release is the donation of a quilt to their chosen charity or individual in need. Readers can RSVP to the Facebook chat any time between now and October 7 by visiting the Quilts of Love Facebook page. All fans are encouraged to invite their friends to join in the fun. A getaway on a charming island may be just what Alyssa needs — if only she can let go of her past. As the quilt’s story takes shape, Alyssa gains amazing insight into her grandmother’s life . . . and attracts the attention of the handsome Scott Whitman, an island resident in charge of hotel transportation. Will memories of her past keep Alyssa from letting go? Or will the quest to piece together the heirloom quilt restore Alyssa’s fractured heart — and bring healing to her entire family? Amber Stockton is an award‑winning author, a national speaker and a direct‑sales brand partner with Nerium International. She lives with her husband and fellow author, Stuart Vaughn Stockton, in Colorado. They have a daughter and a son, and an Aussie/retriever mix named Roxie. Three of her novels have won annual reader’s choice awards. Find out why readers love her by visiting her website AmberStockton.com. 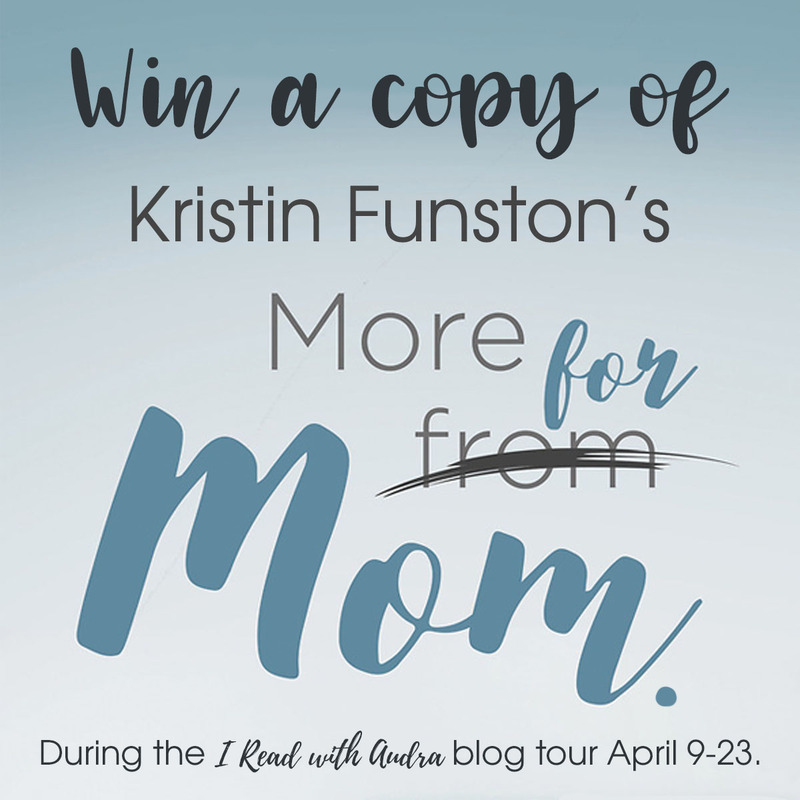 Readers can also keep up with Stockton via Facebook (Author Amber Stockton) and Twitter (@AmberStockton). A quilt holds the secret to a killer still at large — and who his next victim will be. Following an attack that killed her mother and stole her ability to speak, 21‑year‑old Sophia Montgomery has no choice but to accept her estranged grandmother’s offer to return to their family home. Although detective Julian Frazier is working hard on the case, Sophia unknowingly frustrates him because her inability to speak thwarts her eyewitness evidence. The fact that Julian is undeniably attracted to Sophia doesn’t help either, so Julian hides his feelings as concern for a trauma victim and focuses instead on finding the killer. Little do they know, the clues to solving the case may be right in front of them, displayed in Sophia’s mother’s “special” quilt design. Who will realize the secret Sophia’s unwittingly been hiding in plain sight? When the truth comes to light, will Sophia find her voice again? Or will the murderer — still at large — silence her forever? Robin Caroll is the author of 22 published novels. When she isn’t writing, Robin spends time with her husband of 20‑plus years, her three beautiful daughters and two handsome grandsons, and their character‑filled pets at home in Little Rock, Arkansas. 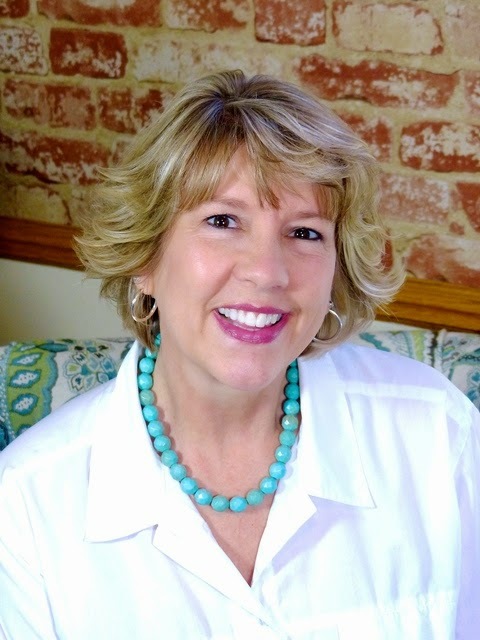 She gives back to the writing community by serving as conference director for ACFW. Her books have been named finalists in such contests as the Carol Award, HOLT Medallion, Daphne du Maurier, RT Reviewer’s Choice Award, Bookseller’s Best and Book of the Year. 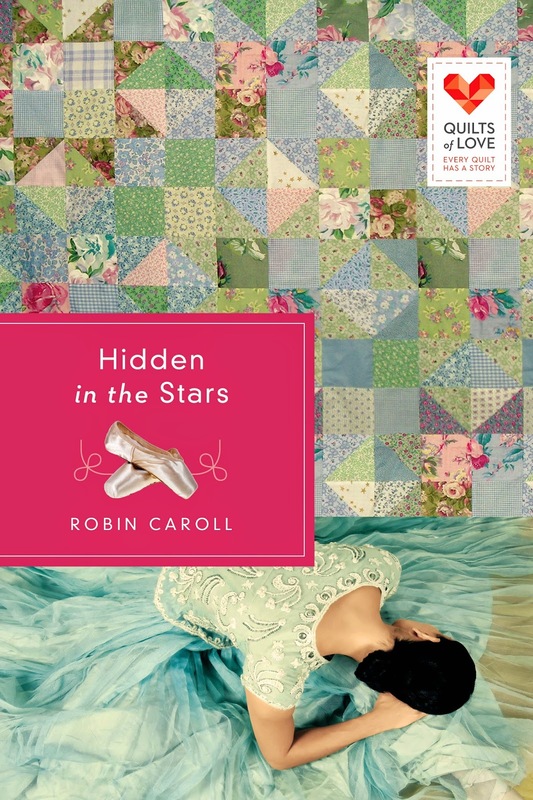 For more information about Robin Caroll and her books, visit her online home at www.robincaroll.com. She is also active on Facebook (robincaroll) and Twitter (@robincaroll). Even the simplest songs need a little practice sometimes! Jesus rose for all the children of the world. I also saw a version of the song that had it "red, brown, yellow" instead of "red and yellow," but this is the traditional way to sing it. For the last couple of days, I have been on what is evidently going to be my "vacation" for the year. I use that term loosely. I didn't completely disconnect from work (I checked email way too much), and it doesn't feel like I have been much of anywhere. 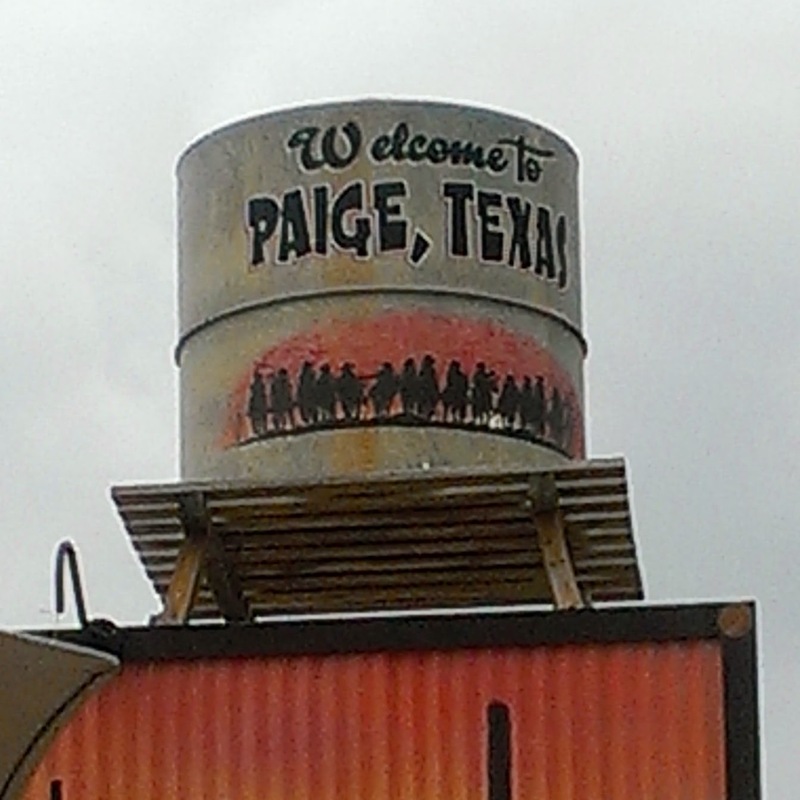 In fact, my boss called as we were arriving in Paige, TX, and she rarely ever calls me (I call her). We were trying to find something with Paige on it to see if we could. It was kind of a bet we had going on. Mom wanted to go to Antiques Weekend in the Round Top, TX area. It's one of the countries largest flea market type antique sales. Officially, next weekend is THE weekend, so not everything was up and running, but there was plenty, let me tell you. It's turned into a month long event with vendors staying in travel trailers all over the place (next to the porta-potties). It was unlike anything I had ever seen. Tents set up in huge fields filled with a lot of overpriced old stuff. There was a lot of large, European, "Old World" furniture and decorations too. That was really expensive. When Mom asked me about going, I thought it was an olive branch of sorts since I couldn't find anyone to go on vacation with me this year, and she felt bad for me. The truth is, I don't know why she asked me other than she just wanted to go. If she honestly thought I would enjoy it, she must not know me very well. The truth is, it's not what I wanted to, but I thought she was trying to create a mother/daughter outing at first. Or maybe she just wanted someone to take her. It was a maddening waste of time, even if Mom did find this one cup and saucer she was looking for. That was miraculous in and of itself. I'm still not sure how that even happened. There was much complaining (not by me) about all the walking. I was hoping to find a headboard for my guest room and a small table to go next to my chair in the living room where I crochet. I quickly found that I wasn't going to find either, especially at a price I wanted to pay. After looking around Thursday afternoon and a good chunk of Friday, I announced we were going to stop by IKEA in Round Rock on the way home. In my mind, I had great aspirations of being like Lara Spencer (Good Morning America) and the contestants on Flea Market Flip. No such luck. If I saw anything cheap I could have made over, I would have been ok. Only at one stop did I really gain inspiration, and soon my dining room chairs will be painted. Dad was on a search for hardware he could use to make other things. He found a few things he could make into something we saw at a particular booth at that stop I just mentioned. 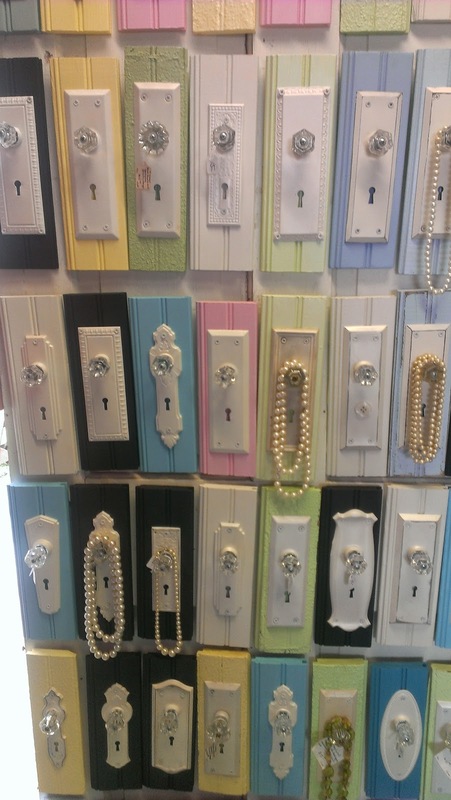 He's going to make some of these necklace holders. All I found was a wooden cutout of "I love you to the moon and back" that Dad refused to try to cut out himself (I'll have to post a picture once I paint it for Peyton's room) and a Christmas tree made out of the same kind of wood that Dad and I have been using to make letters. Now he can make trees for Christmas and sale. (Technically, I guess I did spend the most money.) He wants to sell them at a garage sale because he has like 5 items he needs to put in a sale. I told him to not waste selling such things at a garage sale because I would like to make some hats up that I could sell at a craft booth somewhere. We had to stay about 45 minutes away from where most of the action was in Warrenton for the two nights we were down there. There's not many places to eat there, so we ate at this place called Maxine's Cafe three times. Twice for breakfast and once for dinner. Breakfast was fabulous! 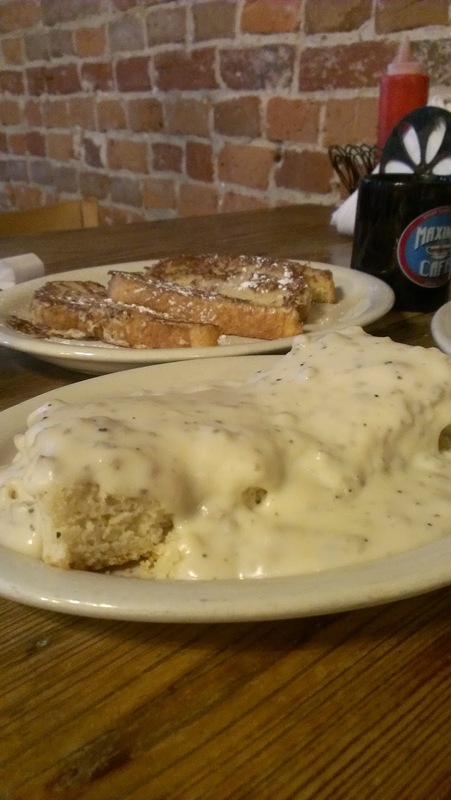 They had made the cover of Texas Monthly a few years ago for the best breakfasts in Texas (and 40 best cafes). I wish we had gone somewhere else for dinner. 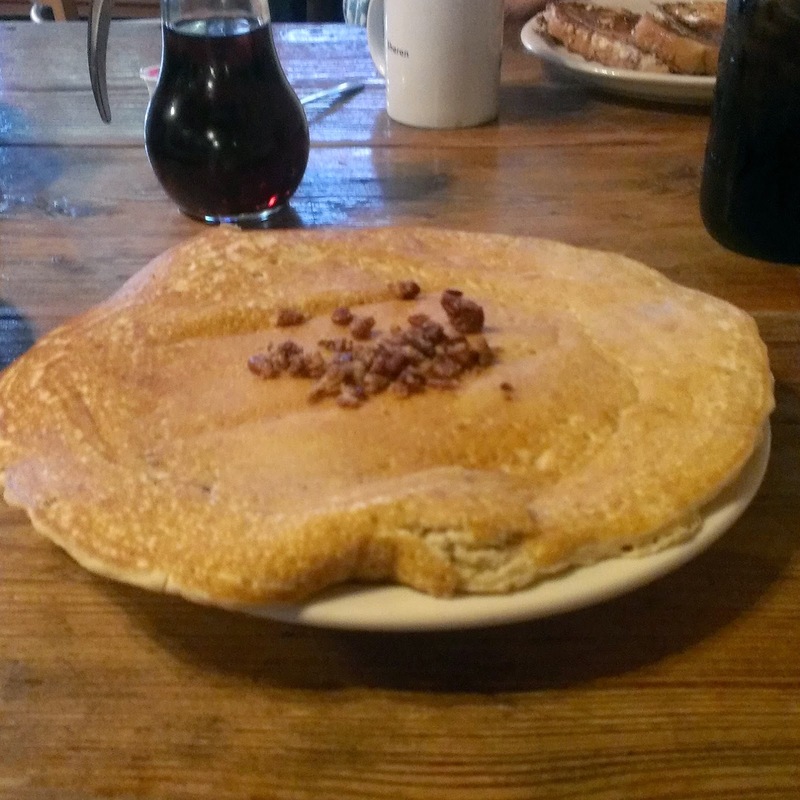 It just didn't live up to expectations after the griddle cake I could only eat half of at breakfast. It had praline pecans on top and mixed in. I bought me a mug there because it isn't a vacation without a mug purchase. Mom didn't even find her a shot glass. The only shot glasses she found were some a guy was trying to sell at his smokey smelling booth. On Thursday night, Dad watched the last place Rangers while I inwardly mourned that I was having to DVR the season premieres of Grey's Anatomy and Scandal. On Friday night, we went to see This is Where I Leave You because we go to the movie an average of once a year (Christmas and sometimes vacation). The language especially was atrocious. It was one of those movies you are embarrassed to watch with your parents. On Saturday morning, we headed home content to mark the Antiques Weekend experience off of our bucket lists never to return. The trip home was redeemed by finding my headboard and a nightstand for the guest room along with a rug for my kitchen (some funky European size that was actually the right size) at IKEA (I moved the table I had in there next to my chair), a stop at Hobby Lobby for a couple of things we needed, and the requisite vacation stop at Cracker Barrel for chicken and dumplings. On the way down, at least I found some shirts at Lane Bryant in Waco. I also found my birthday present at the Zales Outlet when Mom had to go in to pick up a ring she had repaired. However, the moral of all of that is that we should have just gone up to Frisco shopping instead of wondering the hot fields of middle of nowhere south Texas. 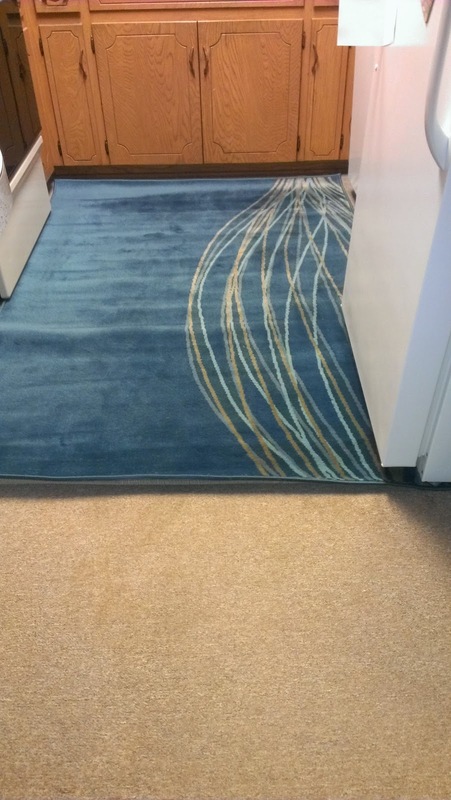 Peabody realized his faith had little connection with the world around him. He had inherited a westernized view of Christianity that too often glorifies personal success, comfort and individualism to the detriment of the lifestyle to which Jesus calls his followers. He realized Jesus was calling him — and all of us — to an all-or-nothing lifestyle, not a pick-and-choose faith salad bar. Something had to change. 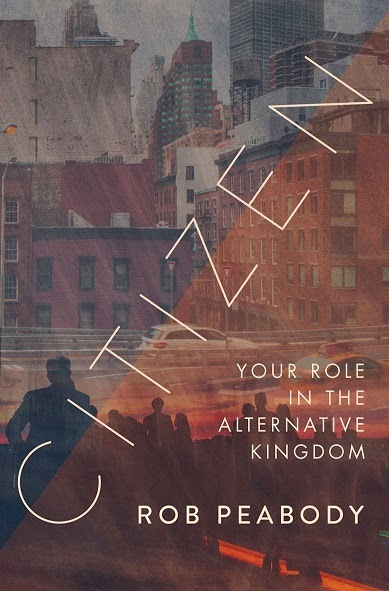 Q: Let’s start off by talking about the title of your book — Citizen: Your Role in the Alternative Kingdom. What is the “alternative Kingdom”? The “alternative Kingdom” is the way in which God originally intended for creation to live. In the Garden of Eden, everything was right, perfect and the way it should be, but man’s sin corrupted this perfection. Ever since, all of humanity has been subject to living in a world that is not right; there is something wrong with it. We find in the Gospels that, through Jesus, God is setting the world back to the way it should be, and when we find Jesus, He invites us to do the same. I find it interesting that at the height of the Roman Empire, Jesus (and later the Apostle Paul) begins speaking of the “Father’s Kingdom,” or a new way of life. He didn’t speak of a better empire or corrections to the current world system but rather a completely different kind of Kingdom. Jesus showed us how to live as part of the only Kingdom that will truly last and the Kingdom that brings heaven to earth. He then He empowers and releases His followers to do the same. The “alternative Kingdom” is the “Jesus way” of living life. It is a rebellion of righteousness in a broken world that is far from God. Q: You once held a position as the lead campus pastor at a mega-church in Texas. While there, you had a major realization about your life and work. What was that realization, and what did it lead you to do? I was 26 and had just finished seminary when I was promoted from young adult pastor to the new role of leading our newest church campus. It was my dream job with great influence, hundreds of congregants and the chance to lead a thriving church community. The church exploded with excitement. People were being baptized and saved, and true growth was occurring. It was all going to plan . . . and then it hit me. I couldn’t go on this way any longer. God was doing something in my heart. Later I would come to describe it as a “holy discontent.” I began realizing the way I viewed church was off-kilter. For me and many others worship was being reduced to an hour time slot on Sunday morning. Don’t get me wrong; worship services are an essential part of following Jesus, but God was showing me that true worship transforms a life completely, not just when it is time to sing. Monday through Saturday is just as important as Sunday morning when it comes to following Jesus. This realization led me to our city mayor’s office, along with my friend and worship leader Joel Warren. We told the mayor Jesus did not just save us from something (hell and eternal separation from Him), but He saved us for something. Stated simply, we wanted to see the worship overflow from the church building to the streets in which we lived. We wanted to be agents of change where we lived. We asked the mayor about the greatest needs in the community and vowed to strive to meet those needs in the name of Jesus. We mobilized the church to adopt local schools and mentoring programs to teach life skills to the down-and-out in our community. We began the process of being the church and not merely going to church. This wake-up call for me personally led to the formation of the Awaken Movement. Later my family moved to London, England, to facilitate Awaken’s vision in the U.K., as well as church-planting amongst those in their 20s and 30s who would never step foot in a traditional church environment. Q: What did your family and friends think about your move to another country? My family and friends were very supportive of our move to the U.K. Although it was hard for the grandparents to see their only grandchild at the time move across the Atlantic, they understood God had paved the way to London in so many ways. It was clearly His plan too. Q: Do you think the majority of Christians are really living the kind of life Christ calls his followers to? I don’t think so . . . at least from my limited viewpoint of the church in the West. Unfortunately, we have inherited a Christian sub-culture that thrives on individualism and personal choice to the detriment of pursuing the true calling of ultimate allegiance to King Jesus. Jesus makes very bold and explicit claims about what it looks like to follow Him, and for many churchgoers these claims get in the way of how WE want to live our lives. Jesus is calling us to an all-or-nothing lifestyle in the way that we follow Him, not a pick-and-choose salad bar. When Jesus becomes King in our hearts and minds, our actions and behaviors will follow suit. Until that happens we (churchgoers) find ourselves a conflicted people wanting to love Jesus on the one hand, while still bowing to the idols of our flesh. This conflict must be dealt with before we can truly live out the kind of life to which Jesus calls us. Q: You talk in Citizen about how Christians have competing allegiances. What are those allegiances, and how do they stand in the way of Kingdom living? We all have allegiances. Some are healthy and God-given, such as marriage, parenting, being an employee or employer, friendship, etc. When Jesus takes His rightful place in our life, there is a re-prioritization of life that naturally takes place. When this happens, our relationship with the King becomes the lens by which we see all our other loyalties and allegiances. Therefore living for the Kingdom informs all areas of our lives and all earthly loyalties and penetrates everything that we do. According to Jesus, there is no such thing as compartmentalization of certain areas of our lives. Q: You say, “Citizens of the Kingdom should be the most risk-taking people on the planet.” What do you mean? I’m finding this quote is really standing out to people. It means if we have truly died to our allegiance to ourselves and it has been replaced by a greater ultimate allegiance to Jesus, then our lives are no longer our own. In 1 Corinthians, Paul tells us we have been “bought with a price” — that price being Jesus’ own life — and that we died with Him (Romans 6:3) and will be resurrected with Him. So if we have already died and the penalty for our sin has been dealt with, we have absolutely nothing to lose! There is no fear of death for people who have already died. For the believer, death has been dealt with, so what is the worst that could possibly happen to them? I think it is this reality that frees us to live as risk-takers, Kingdom-bringers and radical, righteous rebels who take Kingdom ground during our relatively short time on this earth. I am becoming increasingly convinced that Kingdom ground is not taken any other way. Q: Has the spiritual climate in the U.K. changed the way you view the American church? How so? Absolutely. You never really see your blind spots until you are given a different perspective. Living as an outsider in a different country has given me a unique view into Great Britain but also a different perspective of my homeland. Living in a post-Christian city (London) made up of less than 2% evangelical Christians has opened my eyes to the reality that if the church in America does not make some serous changes, they will go the way of post-Christian Europe. I think the American church, with all its members, money and “success,” is (at times) over-complicating what it means to follow Jesus. I’m finding that as an American pastor, I didn’t really understand the need for unity or Kingdom living amongst the body. I got too caught up in numbers to the detriment of true discipleship. Programs began replacing relationships, and buildings clouded my view of the body. When you live in a city as a part of the tiny religious minority, your faith either falls away or becomes very real. I think the church in America could use some of this shock to wake them up from operating as business as usual before it is too late. Q: Some have called Citizen a “wake-up call to the church in the West.” What is it that American Christians need to awaken to? I’ve thought about this question a lot recently, and I would say discipleship, prayer, unity, stewardship, lifestyle worship and Kingdom-living. What it all comes down to, though, is Jesus. We must re-imagine our lives, re-position what we value, re-identify who we are and re-center all of these things on the true King of the world. Q: Tell us more about the Awaken Movement you helped found. What is its mission and purpose? Awaken was born in 2008 as an organization to help resource the church for action. We inspire, educate and equip local churches to put action to their faith as they strive to be the church outside the walls of the church building. 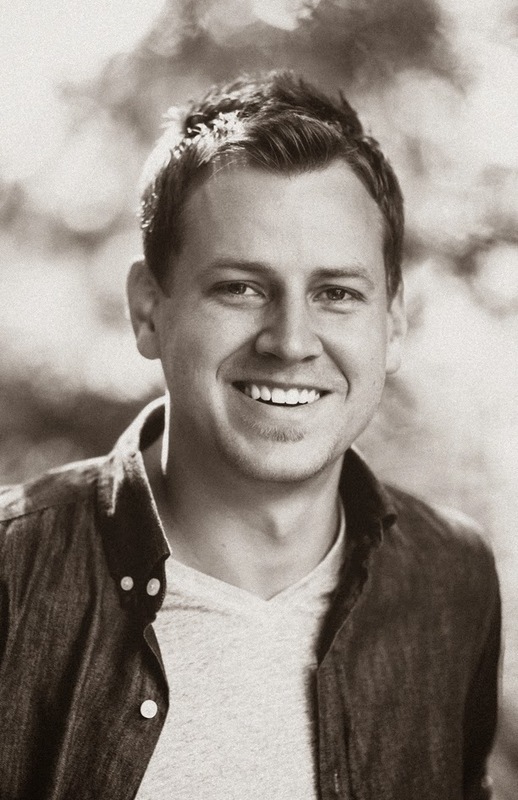 Co-founded by Joel Warren (musician/worship leader) and me, Awaken came out of our work together in the suburbs of Dallas, Texas, as we sought to help our church “reclaim our Jerusalem” and live as agents of change in the cities in which we lived. Awaken is led by a collective of compelled artists, musicians, pastors, photographers, filmmakers, songwriters, authors, missionaries and business professionals who are dissatisfied with the status quo of merely attending church. We desire to see a generation of churchgoers living as Kingdom-bringers in their communities. We create small-group studies, films, music, books and church-wide campaigns to help carry this message and vision to the church in the West. Q: One unique characteristic of the western world is our love of personal autonomy. How can this actually be a detriment to the Christian life? Individualism and personal autonomy are two of the things our Western dreams are based upon. The tricky part is that Jesus lived on earth and the Bible was written from an Eastern perspective and worldview. So the task is to see how Jesus lived, hear His words and examine His life, and then apply that to our 21st-century lives. It seems to me that individualism is actually a Western cultural stronghold that prevents us from living like Christ at times. If the goal of our lives is to make money, be comfortable, save for the future, enjoy life and seek happiness, those values and ideals can be pitted against the very things Jesus is calling us to. We must let Jesus transform our heart and reevaluate what we want to devote our life to. This is especially important when living in a culture where personal autonomy reigns supreme. Q: What do you think is the biggest enemy to the Gospel in America? The world? I believe one of the main ploys the Enemy uses against believers in the West is to encourage them subtly to give in to the silent killers of apathy and fear. Comfort could also be added to this list for many of our brothers and sisters in the West. Q: Does a Christian need to quit his or her job and go into full-time missions work to apply the principles you lay out in Citizen? Most definitely not. In fact, I think that would completely defeat the purpose of my message in Citizen. This book is for everyday people who want to follow Jesus and live for something greater than themselves. Q: How do you hope Citizen changes its readers? My prayer is that Citizen would show you who you really are in Jesus and then release you to live a life more abundant, more fulfilling, more daring and more joyful than what you are currently settling for. There is so much more to life, and it can only be found in our true King. For more information about Rob Peabody, visit his online home at awakenmovement.com, become a fan on Facebook (awakenmovement) or follow him on Twitter (@AwakenRob and @awakenmovement). Read more about Citizen here! They say blood is thicker than water, and in her latest release, Home to Chicory Lane (Abingdon Press/August 19, 2014/ISBN: 978-1426769696/$14.99), Deborah Raney writes a story that examines how the love of our family can help us weather life’s storms. The first book in the new Chicory Inn series introduces us to Audrey Whitman, a mother who has launched all of her children into life and now looks forward to fulfilling some of her own dreams during her empty-nest years. However, not all of her children are ready to stay out of the nest quite yet. Q: They say blood is thicker than water, and the closeness of family is a big part of the theme of Home to Chicory Lane. How did your own experience with family shape the way you wrote this book? We have four grown children and five grandchildren (so far!). I grew up the oldest of a family with four girls and a boy, and then I married the oldest of a family of four boys and a girl. We both have many aunts, uncles, cousins, and we both had our grandparents well into our forties (and even fifties, for my husband). So as you can imagine, family is extremely important to us. We’re both close to our families, and all of the good, the bad, the ugly, the wonderful of being part of a family went into this series. Of course, the novels are pure fiction, but I do find wisps of truth threading their way into my stories, and a few of the funny things in the book may have happened in real life, though not exactly the way they’re told in the book. Q: Home to Chicory Lane introduces us to Audrey and Grant Whitman, an empty-nest couple excited for this new season in life. How do you identify with them? Like Ken and me, Audrey and Grant have looked forward to the empty nest and the time they’ll have alone together now that their kids are gone. We definitely identify with anticipating and then enjoying that empty-nest time (even though there was a short period of grieving that a very precious chapter of our lives had come to an end). But unlike the Whitman kids, who keep trying to come back home, our kids have made a clean break and are scattered around the world from Missouri to Texas to Germany! We miss them and sometimes wish they would move back home. But we never wish it for too long! Q: The couple decides to pursue a dream — turning their family home into a bed and breakfast called “The Chicory Inn.” It can be difficult for a married couple to work together and be together ALL of the time — what kind of challenges do your characters discover and what can other couples learn from them? Well now, that’s where OUR real life comes into play. After a layoff from his job five years ago, Ken started his own business and began working from home. There was a pretty steep learning curve for us to learn to exist happily in the same house 24/7, but like my characters, we did figure things out and have made it work. Today, we can’t think of any better situation for an empty-nest couple. We love it! The secrets that Audrey and Grant discover are: give and take, live and let live, and don’t sweat the small stuff (and it’s all small stuff). But of course, like Ken and me, Grant and Audrey have to learn a few things the hard way. Q: Opening weekend of The Chicory Inn, their youngest daughter shows up at the house with a U-Haul, fully expecting to be able to move home. How much of a responsibility do you think a parent has to take care of his or her adult child? Like the answer to so many good questions, I think this one is: it depends. Most parents’ goal is to launch their children into the world with all the tools they need to make it on their own. But some kids boomerang back for a year or two before they are ready to make it on their own. I think the secret is learning to recognize whether your child is ready, and if not, to help from afar as much as possible, not interfering too much, but offering guidance when appropriate and when requested. Q: Is a parent’s job ever really done? I think it is — or at least it should be — when the child leaves home and is financially independent. Certainly when the child gets married. 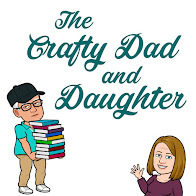 That’s not to say that kids don’t still need a parent in their lives, but Ken and I loved how the relationship switch flipped from parent to friend at a certain point. Now our job is to encourage, enjoy, give advice only when asked and be the best grandparents we can be to our kids’ kids. That’s the true reward of all those sleepless nights raising our kids. Q: A common problem between newlyweds is when the husband wants to pursue his dream, while the wife is not quite sure. What advice do you have for young wives? Any advice I can offer, unfortunately, comes from having done it all wrong. I wish I could turn back the calendar and be more supportive of my husband’s dreams and ambitions — both when we were newlyweds, and more recently, after Ken’s layoff. This is especially true because Ken has always been such a champion for my dreams. For me, fear crept in and I became more interested in being financially secure, rather than being willing to follow God’s leading through my husband’s calling — even when it was a little scary. I probably still have a long way to go before I’m where I should be in supporting my husband, but I’m learning. Q: The Whitmans are a close-knit family, all living in the same community. That closeness provides support, but it also causes tension from time to time. What advice do you have for managing relationships between adult family members? Having made a move just a year ago that puts my entire family of origin in the same town, we are all learning how to set boundaries and how to allow one another’s differences to be strengths rather than points of contention. If I could give one piece of advice, it would be: If you’re angry with a family member, talk to God about it, not the other members of your family. The other thing I think my family has done well is that we’ve never let THINGS be more important than relationships. Q: How close do your four adult children live to you? Are any scenes in the book based on your own family experiences? Sadly, they all live out of state, and our oldest son is out of the country in Germany. My kids always say they see a lot of our family in all my books, so I’m sure they would recognize our family in parts of this series. But I’ve not intentionally based the book on our family, other than the fact that, like the Whitmans, we are Christians (albeit imperfect, human Christians) trying to live out our faith in Christ as authentically as possible. Q: Audrey wants to help her youngest daughter during her marital crisis, but she is also careful not to overstep her role. What advice do you have to help parents find the balance between helping their adult children and interfering in their lives? 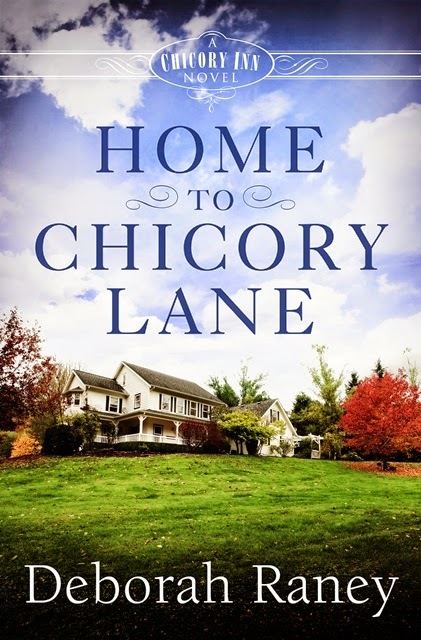 Q: Home to Chicory Lane is the first in the Chicory Inn series. How many books will there be? Can you give us a hint of what we can expect in future titles? Five books are planned for this series (and I have an idea for a special Whitman family Christmas story I’d love to write someday as well). Each of the books in the series will center on one of the Whitman’s children, whom the reader will get to know through the various issues they deal with. The second book, which I’m finishing now, is the story of the Whitman’s eldest daughter, Corinne, and her husband, Jesse, as they wrestle with issues in their marriage brought to light by a co-worker’s accusations. The third book will explore Danae and Dallas’s challenges with infertility. The fourth book will follow the Whitman’s widowed daughter-in-law, Bree, as she falls in love again and struggles with separating herself from the family of the heroic husband she lost in Afghanistan. The final book will find the remaining Whitman brother, Link, falling in love with a woman the family isn’t sure is right for him. The more I work on the early books in the series, the more I fall in love with this family and can’t wait to tell each of their stories! 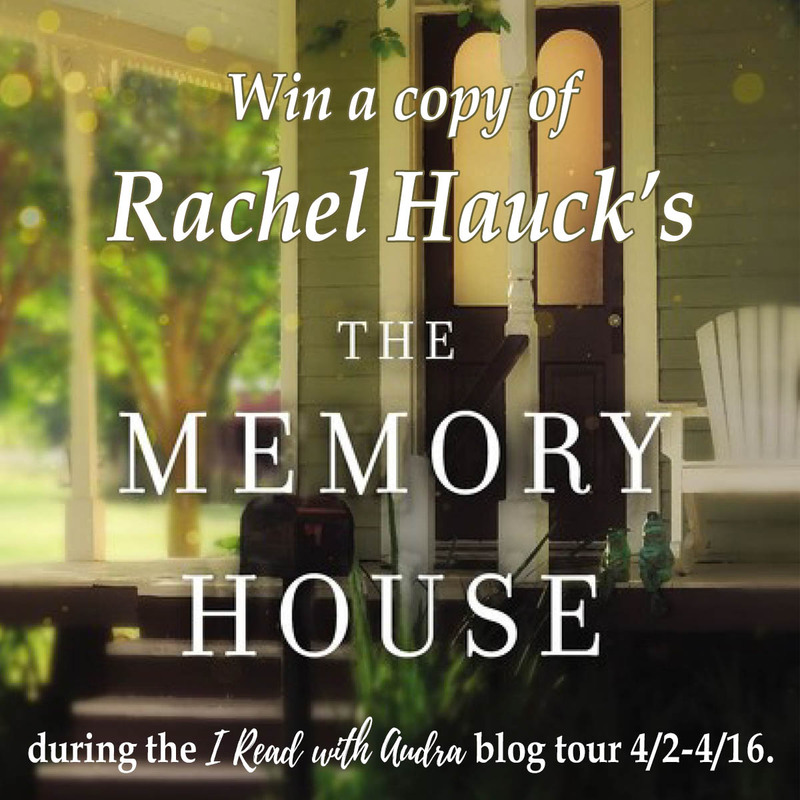 Q: What do you want your readers to take away with them after they’ve closed the pages of Home to Chicory Lane? 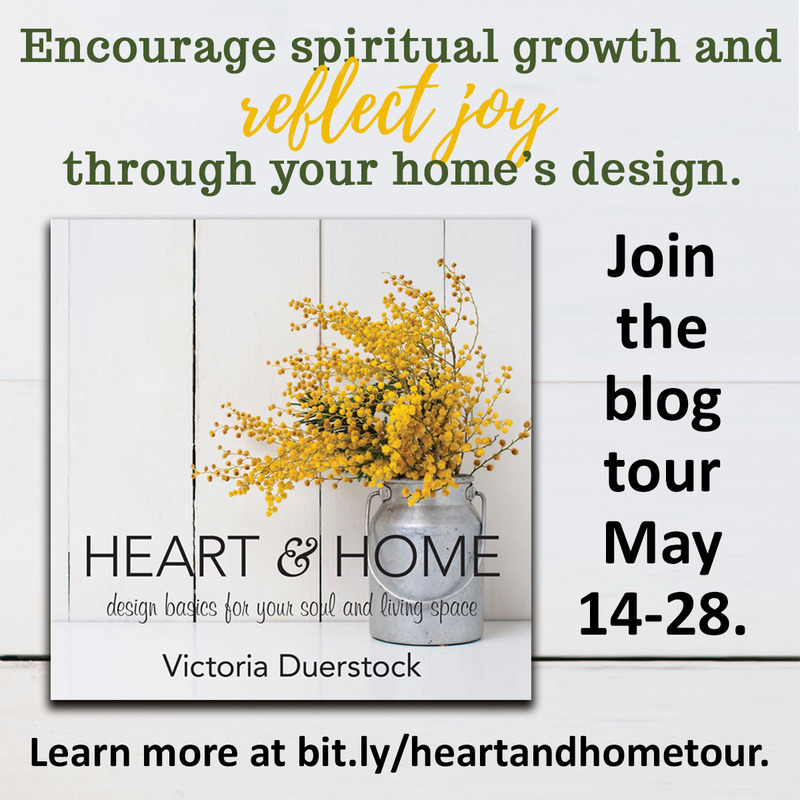 I hope readers will come away with a new appreciation for the families God has placed them in — that they will learn to see past the warts and quirks to the treasure that is in each family member God places in our paths. Family relationships are hard work, but they are so very worth it! Nowhere else in my life have I found such total acceptance for who I really am. Nowhere else am I so free to laugh and cry and FEEL every emotion life brings. Nowhere else have I grown more in my faith than in the midst of my family. For more information about Raney and her books, visit her online home, become a fan on Facebook (deborah.raney) or follow her on Twitter (@authordebraney). 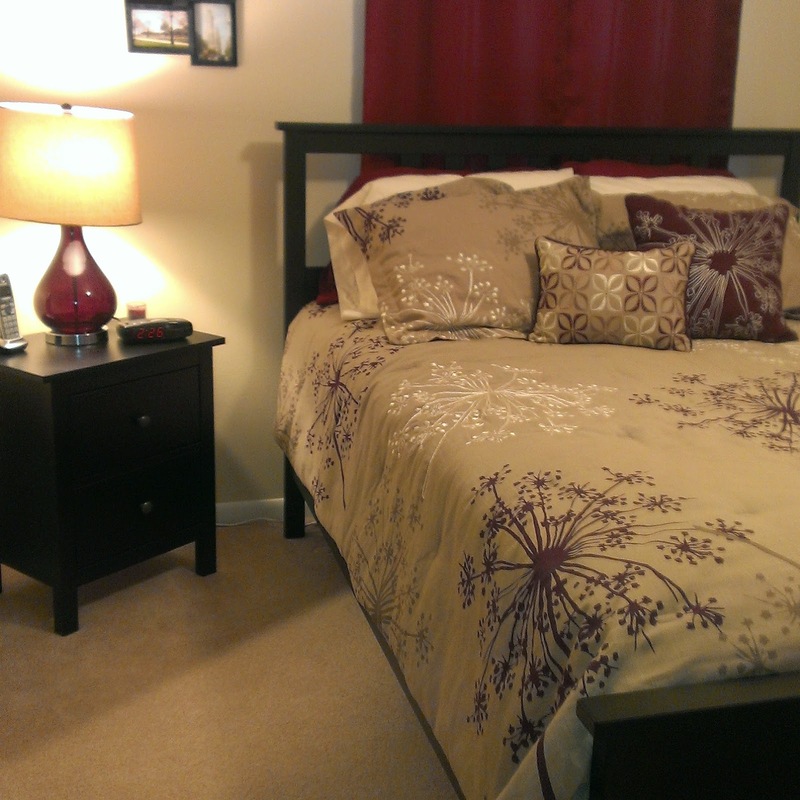 Read more about Home to Chicory Lane here! God is at work everywhere. And every-when. We only need to open our eyes and take the time to notice. Michael Yankoski became jaded and disillusioned with his life as a Christian motivational speaker, feeling as though he was another act in the “Christian Carnival.” Religion started to become a façade instead of a deep, nourished, lived experience of faith. He knew he needed to stop talking about his faith and begin living and practicing it. In a sort of desperation, Michael dedicated the next year to engaging various spiritual practices, and The Sacred Year is a firsthand account of the downs and ups, the failures and successes of an honest search for answers to the human yearning for life, love, and God. It’s time to stop talking about your faith and begin living and experiencing it. Join Michael and #EmbraceTheSacred—seek out God at work in the mundane and attend to what God is doing in your life. Share those moments on Facebook, Twitter, and Instagram and make sure to use the tag #EmbraceTheSacred. As a thank-you for ordering The Sacred Year, Michael is giving away a free ebook! Email your proof of purchase of The Sacred Year to TheSacredYear@gmail.com, and you will receive A Straightforward Guide to Three Essential Spiritual Practices ebook for FREE! Learn more here. One searcher’s honest and fascinating journey to encounter God, love others, and discover his true self through a year of spiritual practices. Frustrated and disillusioned with his life as a Christian, motivational speaker Michael Yankoski was determined to stop merely talking about living a life of faith and startexperiencing it. The result was a year dedicated to engaging in spiritual practices, both ancient and modern, in a life-altering process that continues to this day. Whether contemplating an apple for an hour before tasting it (attentiveness), eating on $2.00 a day (simplicity) or writing simple letters of thanks (gratitude), Michael discovered a whole new depth through the intentional life. Stirred on by the guiding voice of Father Solomon, a local monk, Yankoski’s life is slowly transformed. Both entertaining and heart-wrenching, Yankoski’s story will resonate with those who wish to deepen their own committed faith as well as those who are searching – perhaps for the first time – for their own authentic encounter with the Divine. Learn more and purchase a copy at Michael’s website. Michael Yankoski is a writer and speaker who compels audiences around the world toward a Christ centered response to our world’s needs. He holds a Masters Degree from Regent College, and is the author of several books including “Under the Overpass: A Journey of Faith on the Streets of America” and “Zealous Love: A Practical Guide to Social Justice.” Michael has served on the Board of Directors of World Vision U.S. and the advisory board of Kilns College. Find out more about Michael at http://michaelyankoski.com.